President Trump appears to be gearing up to effectively declare war on Mexico. It would be the fourth time the U.S. has made war, declared and undeclared, with our next door neighbor. In the first war between the United States and Mexico in 1846, President James Polk lied to the American people by claiming Mexicans troops had invaded American soil and drawn American blood. Countering Polk was an Illinois congressman and future President, Abraham Lincoln, who contested the causes for the war and demanded to know exactly where Americans had been attacked. “Show me the spot,” he demanded. When Huerta was replaced by another revolutionary leader, Venustiano Carranza, who President Woodrow Wilson tacitly supported, the Americans left Mexico, only to return within two years. On March 9, 1916, horse soldiers of Mexican revolutionary Pancho Villa entered the United States and attacked the town of Columbus, New Mexico, killing 17 Americans. Villa’s forces ultimately suffered many dead and wounded when troops from a nearby U.S. Army encampment arrived armed with machine guns. But Americans were incensed. 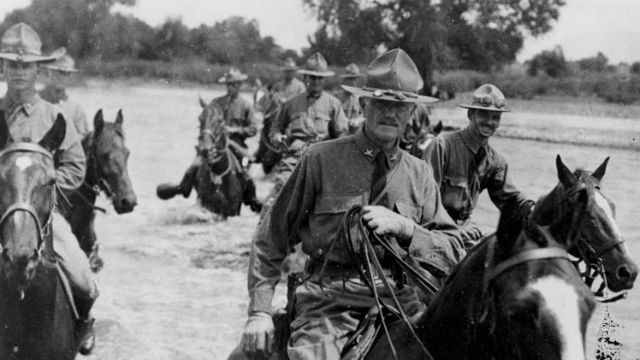 President Wilson knew a good thing when he saw it, so, with a view of helping our British cousins in the European war by abandoning neutrality, Wilson called up the nascent 100,000-man National Guard and sent them to the Mexican border to train. A force of 10,000 aided by airplanes was dispatched into Mexico to hunt and kill Villa. They were commanded by Brig. Gen. John J. Pershing, the later commander of American troops in Europe. The American force was in Mexico for 11 months, but failed to capture Villa. In a firefight at Carrizal on June 21, 1916, with Mexican federal troops under Carranza, dozens of American soldiers died and a group of them were captured and held until all American units left in 1917. The current strain between the United States and Mexico is the worst of any since the failed hunt for Pancho Villa. All of it has been fomented by Trump, starting with his depiction of Mexicans as rapists, drug smugglers and criminals in the speech announcing his candidacy. Trump, without a scintilla of knowledge about international trade, calls the most successful trade agreement in American history — the North American Free Trade Agreement with Canada and Mexico — the “worst” deal ever made by the United States. His solution: gigantic tariffs on steel and aluminum imported from Mexico and Canada. It was an impulsive decision, or course, maybe even the “worst” — to use Trump’s term — by a President in years. It had nothing to do with the facts. The United States actually sold $3.6 billion more steel to Mexico over the past two years than Mexico sold to the United States. But the fourth war with Mexico is on. President Trump ordered it. Mexico struck back with tariffs on U.S. agricultural products, including apples, cranberries, cheese, potatoes, pork and whiskey. Trump voters in Iowa and Wisconsin who raise hogs, Kentuckians who make whiskey, Missourians who make nails from Mexican steel, and Michiganders who raise apples and make auto parts from Mexican steel will all suffer. Many will lose their jobs. This isn’t 1916. Many American jobs are being threatened by the imposition of Trump’s tariffs on our next door neighbor. 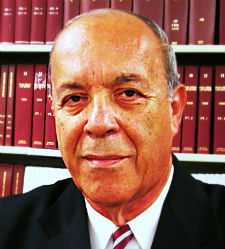 Raoul Lowery Contreras is a political consultant and the author of “The Armenian Lobby & American Foreign Policy” and “The Mexican Border: Immigration, War and a Trillion Dollars in Trade.” Frank D. Gomez is a retired senior foreign service officer.